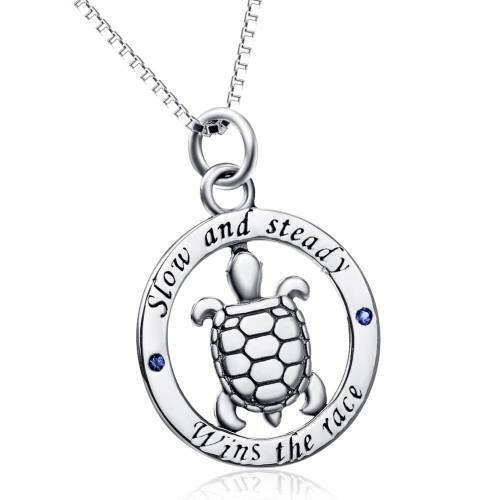 We are giving away TWO of these All Sterling Silver “Slow and Steady Wins The Race” Necklaces! 1) Be sure to “like” Favorite Run page, if you don’t already. 3) Tag someone who would want to win this necklace as a comment on this post. 4) Tell us how inspirational running jewelry can get you motivated to run more! “Better to run slow than not to run. I love the one that says 6 minutes a mike or 12 minutes is always a mile. “I just became a 5k runner at the age of 39. I completed my first one in March and my second in May. I was slow, but I finished!! I dropped almost 40 pounds and after my second finish, I signed up for a 5k for every month this year to ring in my 40th birthday in November. This entry was posted in Favorite Run Giveaway. Bookmark the permalink.